Crabbing is beginning to heat up. With the warm water temps the critter are crawling and eating. The crabs did not hibernate for a long period this year so they will have a good amount of meet on them. 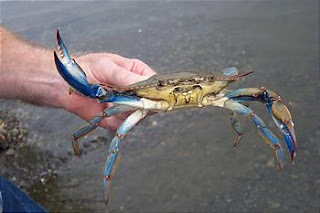 With some of the nice whether we have coming up get the kids together and hit your favorite crabbing hole befor others get out there. March 23 – 24 – 25 is Girls weekend hear in Sea Isle City. So ladies leave the kiddies with the husband lode up the car and head down for all the activities and specials for the Girls weekend. But be for you leave be shore to stop Sea Isle Bait and Tackle and get the ( Old Man ) a Thanks for the weekend gift maybe a new rod or reel we also have gift cards so he can pick out his thanks for the weekend Off gift. There will even be a lady in the store Sunday afternoon to help you pick out that special gift. The blues are back in town…. Just had the first blue of the year weigh in 6lb 6oz. The fish was taken in Corson’s inlet mid morning and mid tide. It took blood worms. If there is one there are more !!!!! !